Frittatas are the brunch host's best friend—most of the prep work can be done ahead of time, they tend to be shockingly easy, and they have a fabulous visual and culinary effect. Perfect as they are for brunch, knowing how to make a decent frittata will also serve you well if you want to turn ho-hum leftovers into a whole new dinner. The flavor combinations are pretty much endless—simple frittatas of just eggs and cheese are nothing to sneeze at, but concoctions full of vegetables and shrimp, toasted bread cubes, or cooked pasta are all worth exploring. They are, after all, pretty much an open-faced omelet. Find the perfect frittata for your next brunch—be it Easter, Mothers' Day, or Christmas morning—below. The key to this gorgeous, perfect-for-spring frittata is to cook the leek greens until they are wonderfully tender—yes, leek greens are edible when cooked enough! Once that's done, you just add a ton of fresh herbs, whisk up the eggs, pour everything into a pan, cook it up, and serve it with pride. This frittata is loaded with mushrooms, potatoes, asparagus, and tomatoes—so plenty of vegetables. Eggs, bacon, and Parmesan cheese provide the protein and extra flavor. Feel free to use regular bacon instead of the turkey bacon listed. This recipe shows the degree to which a frittata is part-omelet and part-casserole. With ham, cheese, peppers, and eggs, this frittata has all the flavor of a classic Denver omelet in one easy baked-to-perfection frittata. Spinach, broccoli florets, cherry tomatoes, and plenty of basil are held together with egg whites in this no-yolk frittata recipe. Add the optional Parmesan cheese for a nice kick of salty flavor. These mini-frittatas are made in muffins tins for an individual frittata experience. It's the perfect method if you know your guests have conflicting dietary restrictions. Cheese in this one, no cheese in that one, etc. This recipe walks you through making a simple frittata step-by-step. Check it out to make an easy frittata or just to see the method used in most frittata recipes. Using frozen hash browns makes quick work of this filling and crowd-pleasing frittata. A bit of diced red pepper and some mozzarella cheese bring color and cheesy goodness to the table. Green onions, onions, kale, and eggs—that's pretty much all it takes, along with a bit of butter, to make this lovely green frittata. Perfect as a vegetarian option at brunch. Leftover pasta cooks up beautifully when surrounded by yummy eggs. It may sound odd, but it's tasty enough to go ahead and boil up some pasta to have on hand just to put in this basil-laden frittata. Shallots and peppers add extra flavor, but sautéed mushrooms are the real stars in this easy frittata. Perfect on its own, with a side of toast or cinnamon rolls, or even some bacon or sausage. Broccoli and cauliflower bring their bold, nutty flavors together in this simple frittata full of fiber, vitamins, and flavor. Cooked pasta adds body. Thyme leaves give it that herbal edge. And plenty of provolone cheese keeps things deliciously melty. 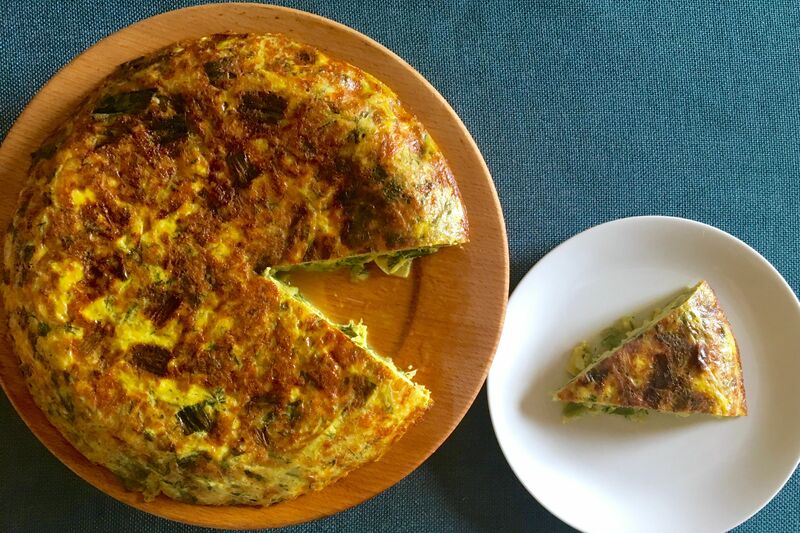 Also known as a Spanish tortilla, this frittata is heavier and more substantial than some others just because it is loaded with sliced potatoes. A nonstick pan is definitely your friend when making this creation. Classic breakfast flavors come together in a single dish. See how to get tons of flavor with few ingredients with this simple spinach, bacon, and cheddar frittata recipe. Have spiralizer, will frittata. Or at least that's what this frittata recipe will have you doing to great fanfare and appreciation when you bring it to the table. No spiralizer? Look for pre-spiralized vegetables at specialty grocery stores for an even easier creation. This quick vegetable recipe shows you how to use your favorite vegetables in combination with herbs and goat cheese to make a delicious brunch dish... or just a simple supper. Thinly sliced zucchini is an excellent foil for flavorful farm-fresh eggs in this simple frittata. Good with a side of bacon, sausage, or just a fresh green salad.